Another valuable edition to Phaidon Press's fast-growing 20th-Century composers series, following the award-winning design formula set by its predecessor volumes. It includes some 230 pages of profusely illustrated biography, followed by a classified list of works, a list of material, available in English, for additional reading, and a selective discography that few would argue with except that it was compiled just too late to include the fabulous new EMI recording of La Rondine (the one Puccini opera that is still grossly and unfairly neglected) with Gheorghiu and Alagna that must surely now supersede the Sony Te Kanawa/Domingo recommendation. Later, with luck, some of us grow to love him all over again, this time usually for good." One distinguished English critic observed that opera houses need Puccini the way farms need dung, meaning that without La Bohème, Tosca and Madama Butterfly, most opera companies would be in penury. Defending Puccini in the context of criticism for his gift of melody, Wilson reminds us that "he had the ability to write a good tune and then place it seemingly effortlessly in the context of a work that is beautifully crafted, unerringly paced and precisely coloured" Elsewhere Wilson consistently emphasises Puccini's instinctive feel for drama and his supreme skill as an inventive and imaginative orchestrator, so that the background to La Bohème and Il tabarro, for instance, are brought sharply into focus. All the operas. commencing with the gothic Le Villi through to Turandot, unfinished at the composer's death, are discussed and analysed at length, and Wilson offers many interesting insights. For instance, of Tosca (described by the American scholar and critic Joseph Kerman as "that shabby little shocker"), Wilson writes: "Scarpia's lustful voicing of his Credo, which coincides with a choral Te Deum . . . at the end of Act I, is a brilliant coup de théatre of a sort only Puccini (or perhaps Verdi) could have devised." Yet Wilson also suggests a missed opportunity-- the chance to end the opera exactly as it had begun, with a series of exultant chords that depicted the brutal Scarpia even before he appeared on the stage. Were they to he ironically hammered out by the orchestra as the curtain falls, these same chords would suggest Scarpia to he posthumously gloating over the fate of Tosca and Cavaradossi." The life of the composer is brought into sharp focus. His escapades as a student, which he would recall in La Bohème, are covered: so too are his passions for shooting waterfowl, fast cars. and speedboats-- plus the many women with whom he found solace (including Sybil Seligman, wife of a London banker, who gave him much artistic encouragement and support). All these distractions were sought as an escape from an unhappy marriage to the woman with whom he had impulsively eloped years earlier. Elvira Puccini had once been the wife of one of his friends. At that time she had been a handsome young woman. But she had a flashing Italian temperament, she was strong-willed, a scold, and obsessively jealous of her husband. She booby-trapped his trouser pockets with camphor and his drinks with bromides. She denounced Doria, one of Puccini's domestic servants for having an affair with her husband. Ironically, it appears that Doria, perhaps, was one of the few women who came into Puccini's orbit who did not, although Wilson seems to suggest that the jury may still he out. "Did she have ideas above her station? Did she hero worship Puccini? Did he encourage her?" To escape Elvira, Puccini travelled extensively, often to oversee the production of his operas in fine detail. He was meticulous and merciless in his obsessive search for perfection in the production of his operas: probably a significant contributory factor to their success. 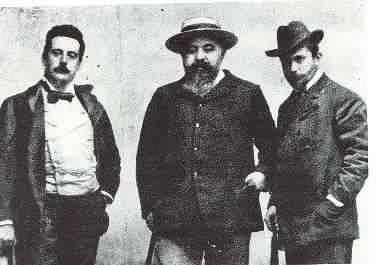 This obsession and insecurity rubbed off onto his long-suffering librettists, especially Guiseppe Giacosa and Luigi Illica who had to go through rewrite after rewrite before Puccini was satisfied. Their work and that of' Puccini's publishers, Ricordi, are also well documented.